What's the success-rate of your mentoring students? 100% of everyone who I trained for the whole period of 3 months succeeded in producing an income with their traffic agency and I'm convinced that with ambition and willpower anyone could reach the results showcased on www.soloaduniversity.com. Do you have a guarantee in place? Yes, I 100% guarantee a super-fast delivery of your business website and business funnel within just 7 days after we start working together. 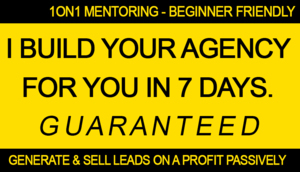 This allows you to launch your business after just 7 days already. There's no need to go through a never-ending video course, learn how to set up your website yourself or to do anything other than to start making profits with your business right away. How much can I expect to make with your mentoring? I'm not allowed to present these details on the WSO thread, so I recommend you to visit www.soloaduniversity.com. You will find the latest in depth-case studies there and learn what my students say about my mentoring after working with me for months. What do you mean by "exclusive" mentoring? I only take on 1 student at the time, every few months to concentrate on helping that student to succeed as fast as possible. I think this is the best way for you to make progress with the highest level of focus. Being blunt with you here, this is not a scalable mentoring program that I created to sign on 50 students at once making six figures immediately, flooding the market with new agencies and keeping everyone satisfied with weekly group calls. I'm not a fan of those coaching programs myself, so I decided to help people on a higher level. The price differs for everyone because it depends on how long I will guide you and what your current situation / backround is like, so I we'll discuss this on our strategy call. You can get a sense of a required budget from the application-form on www.soloaduniversity.com. Generally speaking, it's affordable for everyone and the monthly cost to maintain your agency will be below $50 / month. Can I apply if I have no experience? Yes - that's perfectly fine. I started the same way. I tried selling traffic before and never made it work. What can I learn from you? Good question. Unfortunately the vast majority of solo ad-related education is quite outdated and basic. I once made the same mistake myself but I realized I had the wrong mentor and moved on. Beating outdated programs out there is actually one of the main reasons why I mentor. The training I have recorded is up to date as of 2019, integrates newest skillsets and besides the video input, I walk you through your objections and obstacles every single week 1on1 on a Skype Strategy Session to help you making progress. And if that doesn't answer your question well enough, let's talk about on our strategy call. Can I apply if my english isn't perfect? Please pm me the price also...thank you. I signed up for the call on Thursday, 28 FEB 2019 at 7:00am, how will this call take place- on Skype, Facebook Messenger, WhatsApp etc. Hi Marvin, would like to know more and the cost of the coaching please. Please PM me the cost of your coaching program. Do you help with cold emails? I want that kind of business. I have over 20 years experience in the industry. I am looking to build a list in a new niche for me "make money online - webmaster training". Do you have experience with what works best and what doesn't for this particular niche? Basically I want to find the cheapest method of paying to receive hits/leads to my opt-in page. I know about udimi already. But do you know equivalent traffic sources that work for this niche that may be cheaper and of a similar or higher quality? If so,.PM me and send me a pricing to get your best traffic sources and method/s on those traffic sources "name-dropped". Could you pm me with the price of the coaching? Ya looking for a rough price for it. Hey Marvin... please PM me with a time to talk over Skype, please. I just filled out the application at your site, but you didn't ask for an email. Please reach me over here by PM or FB messenger. Video unavailable, PM me with cost of course please. hi, please refresh the page.